The tenth major arcana is “Fortune” and most decks show Foruna’s wheel in which someone is strapped to the top and the bottom, their places to be replaced as the wheel turns. But the card is really about luck, and so my alien has a different wheel of fortune. 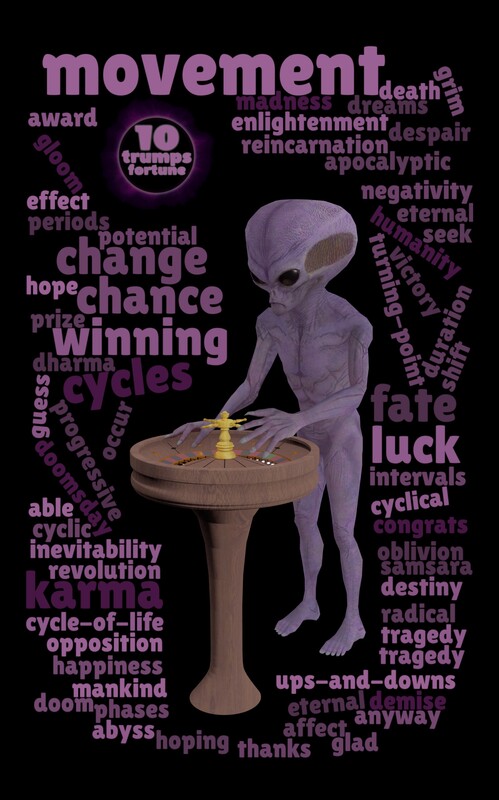 The card is also about cycles and karma and apocalyptic negativity, as you can see at a glance since it’s written on the card to save you having to memorize bizarre associations and exotic imagery. Yes, truly my TagCloud deck is an amazing advancement in 21st century tarot technology.